The first of October it’s exactly 2 year ago that I’ve launched my very first Compagnie M. pattern, the Mara blouse! Today I’d love to celebrate this joyful event with a 2nd Compagnie M. sewing contest. A special contest with 3 categories & levels, one that invites you to push your boundaries. Are you ready to mix & match? Feel like hacking one of my patterns? Or are you a beginner? Than don’t think this contest is too difficult for you: the plain & simple category makes this contest interesting for all types of seamstresses! Be sure to participate because I’ve got the most amazing sponsors. With their support I could create 9 awesome prize packs worth about 3.195 euro in total!!! Plain & Simple: The ideal category for seamstresses with little experience. Sew your favourite Compagnie M. pattern without changing anything to the original pattern. Of course there are still plenty of options to get creative: combine several fabrics, color block or pimp the design with small details without changing the pattern pieces! Mix & match: Compagnie M. patterns are designed to mix & match. Something unique in the pattern design sector! Pick 2 or more Compagnie M. pattern and create your own new garment! In this category you’re not supposed to change my pattern pieces at all, only to combine them in an original way! An example in this category is my own Louisa-Ileana remix. 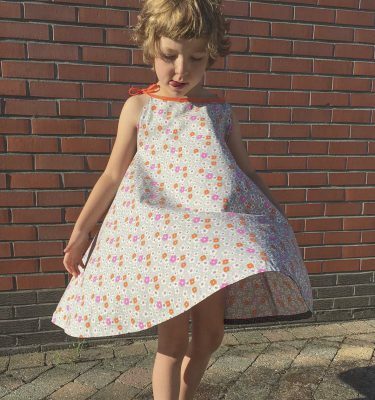 Pattern hack: This category is the play field for the experienced seamstress! I invite you to hack one of my patterns (or a combination of several patterns). All seamstresses that change at least one pattern piece will end up in this category. Of course you may draw a complete new pattern piece too. Just make sure that we can still spot enough elements of the original pattern(s). An example in this category is my Charles dress since it has several new pattern pieces. By participating in this contest, you accept the competition rules. This competition is not organised to get you stressed. :) No negativity please! Sewing is supposed to be fun! Doesn’t matter where you live or how experienced you are. Do you feel like participating with several projects or categories? You can! The jury members are excluded from the contest, sponsors are allowed to participate. The contest starts now and you have until October 25th 9pm (CET + 1 timezone) to send your creation to our contest mail address. From the 25th of October (when all entries are online) till the 1st of November 9pm (CET + 1 timezone), votes are open. Little hearts will appear next to all blogposts. Use these to vote for one or more entries. Only one vote per user will be registered. The judges votes will represent 80% of the result. The public votes that represent 20% will be added according to the ranking of the voting. Note: scores will not be made public. The winners will be announced on the 2nd of November unless there are technical or practical problems. Pictures: attach maximum 6 pictures per project.